You’ve decided to start your own cleaning business an d now you need to work out what equipment you’ll need. Firstly – congratulations! As a manufacturer of commercial cleaning products, we can help you decide what you’ll need to get started. 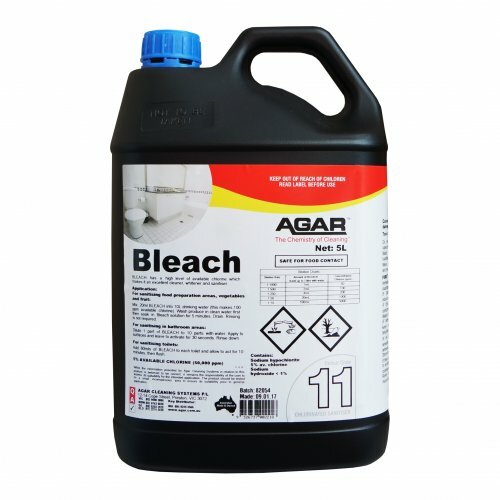 You might want to use Agar’s Colour Coded Cleaning System as a reference. 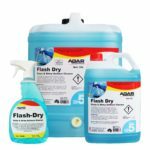 It groups general cleaning chemicals into 11, easy to understand categories and covers the majority of the supplies you’ll need for basic cleaning. It also helps to make cleaning easier, through helping your staff identify which product is used for each task, ie. dark blue/4 is used for cleaning bathrooms. It also reduces the risk of cross contamination, makes compliance easy, includes pre-labelled dispenser bottles and makes training new staff faster. Below is a list of the product categories. Each category is colour and number coded and includes the product label, the chemical colour, the spray or squirt bottles, dispensing equipment and wall charts. Clean floors and wipe down hard surfaces including walls, benches, doors, desks and more with a floor and all purpose cleaner. 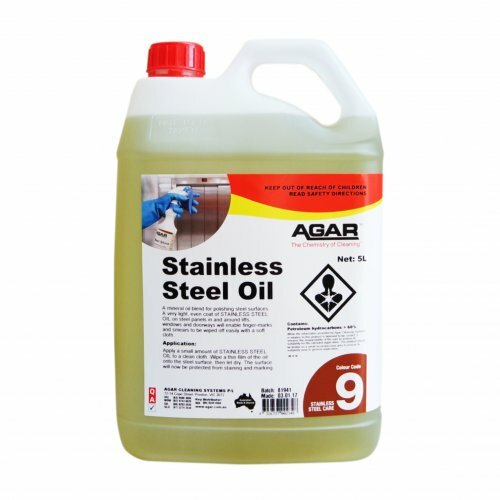 Agar has lots to choose from but if you’re wanting to narrow it down you could select green & neutral pH-7, green and hypo-allergenic Spruce, economical Magic, all-rounder Freshmop, the specialised autoscrubbing detergent Autoscrub or something more aggressive such as Novadet or Superforce. Depending on your needs you could use both a spray and wipe and a disinfectant and antibacterial detergent or just choose one. Both can be used in Agar’s pre-labelled spray bottles, and can be used in a spray and wipe fashion. 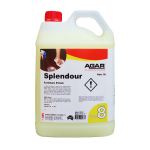 Disinfectant and Antibacterial detergents have the added anti-bacterial action and are great for disinfecting touch points, toilet cisterns, bathroom surfaces, doors, tables etc. Spray and wipes are great if you just want an added boost for wiping down surfaces to help break down grease and soil fast. The disinfectant Lemon is a popular choice while Wipeaway and Citra-mist (green) are much-loved Spray and Wipes. Get yourself a separate toilet cleaner such as Bowl Clean or Sequal (green) and a shower cleaner like Shower Star (green) or Fresco (green) or get one product that can do it all – Fresco (green). Fresco and Shower Star and both excellent for blasting off soap scum, and Shower Star even contains mould inhibitors. It is important to note however that they aren’t suitable for marble, terrazzo or aluminium surfaces (or others harmed by acid). 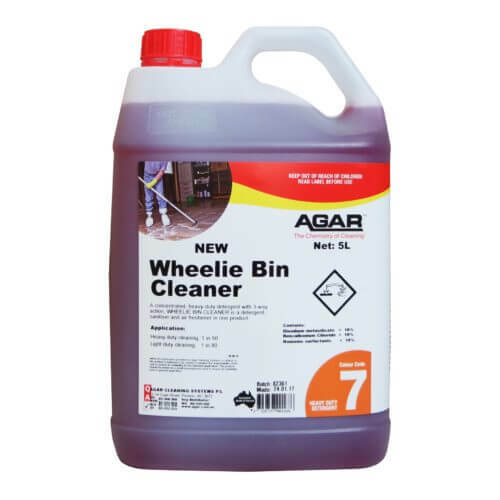 If you want a less powerful – but safe on all surfaces shower or basin cleaner – give Wipe Away or Spruce a go. Glass Cleaner is essential. 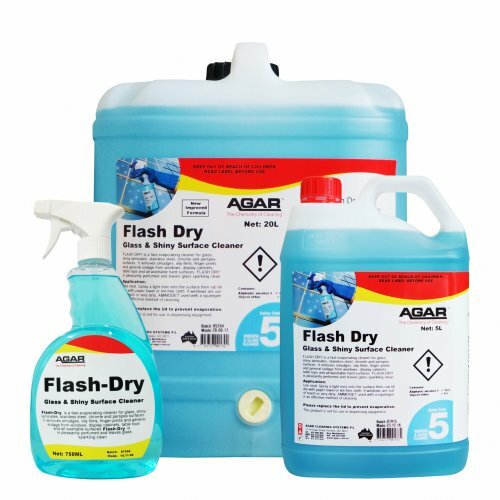 For streak-free cleaning of mirrors, glass, perspex, Caeserstone® , and other shiny surfaces use Flash Dry (super fast drying) or Fast Glass (fast drying). They are used inside in a spray and wipe fashion. Use Ammodet outside for cleaning with a squeegee and bucket. These are great for use in areas that have strong, unpleasant odours. The detergent in them can help remove the source of the bad odour by breaking it down and washing it away. The pleasant fragrance can leave the room smelling fresh. 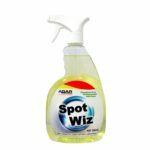 Use in a spray bottle and spray into the air or spray and wipe surfaces. They can also be used in a mop bucket or bucket and cloth. They come in a variety of fragrances – choose your favourite! 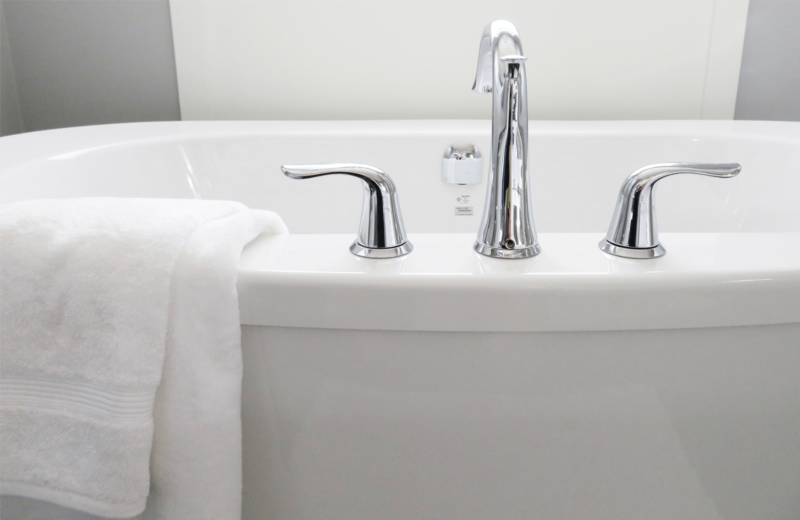 Depending on where you are cleaning, you may also need a heavy duty detergent. Dirt-Off is great for all outdoor cleaning, Presto and React are good for kitchen fat and grease. Wheelie Bin Cleaner is the master of cleaning wheelie bins! Great for making sealed furniture, such as laminate, polished timber, vinyl chairs, chrome trim, filing cabinets, counters and tables sparkling clean! Give Splendour a go! With stainless steel (SS) fridges, oven and appliances all-the-rage at the moment, a stainless steel cleaner is a must. 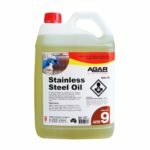 Stainless Steel Oil is ideal for protecting SS surfaces from finger marks while Steel Shine cleans, polishes and protects SS surfaces. Depending on your services offered a carpet spotter can be a good weapon to have in your toolbox. 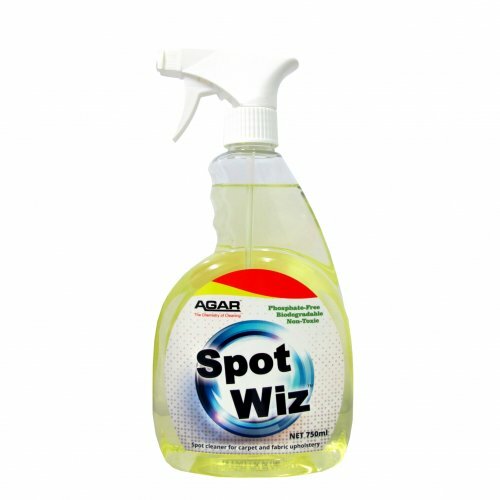 Spot Wiz is recommended as an all-round carpet spotter and is great for gently removing a range of soils from carpet. Its also easy to use! 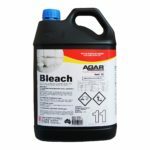 Bleach and Chloradet are two of Agar’s most popular products and for good reason – they are super handy! Bleach is an excellent whitener and mould/germ killer. Chloradet is a stronger, chlorinated solution that also contains a heavy duty detergent. Use both for cleaning showers, concrete, removing mould and disinfecting surfaces. Be careful as they will ‘bleach’ your clothes. Don’t use on aluminium or other soft metals. Don’t mix with other chemicals. If you will be doing house cleaning, an oven and grill cleaner are a must! We make a few different products including Sizzle (more economical), Grill Clean (top-of-the-range) and Kooka-Kleena (doesn’t contain free cautic so milder for the user). These will help you clean those stubborn ovens faster! An all-purpose outdoor cleaner will definitely come in handy! 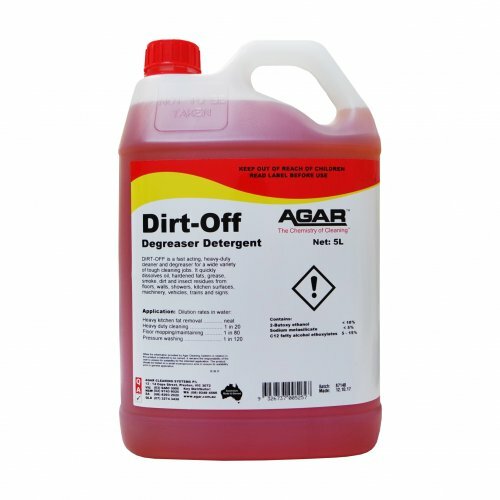 Tackle a variety of tough jobs with Agar’s ultimate outdoor cleaner – Dirt-Off, including cleaning outdoor furniture, walls, ceilings, floors, equipment, machinery, vehicle bodies, car and truck, caravans, awnings, car interiors and vinyl upholstery. Safe on stainless steel, glass, plastic, paint surfaces in good condition, aluminium and porcelain. There we have it! Hopefully this list will make choosing your chemical range a bit easier. If you’re after some more specific products, you can use the product selection tool on the homepage or simply browse our product categories. If you need further help, please contact us or your nearest distributor. Previous PostUltimate Outdoor Cleaner and Degreaser!Next PostISSA Cleaning Expo – Anything you missed?